1. Preheat the oven to 170°C, gas mark 3. Butter and line the base and sides of a 23cm cake tin with baking parchment. For the caramel, gently melt the butter, demerara sugar, salt and cream in a small saucepan over a low-medium heat, stirring now and then. When smooth – after about 10-15 minutes – stir in the scraped-out seeds from the vanilla pod, reserving the pod, and pour into the cake tin. Sit the split vanilla pod on top of the caramel, then arrange the pineapple slices in a single layer, making sure they are fairly tightly packed. 2. For the cake, beat the butter and sugar together until light and pale. Add the eggs one at a time, beating constantly, followed by the vanilla extract. Now fold in the flour, ground almonds and baking powder to make a stiff batter. 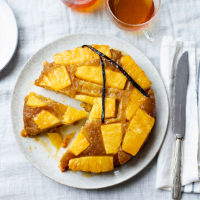 Spoon into the cake tin and smooth flat, being careful not to dislodge the pineapple layer. Bake for 50-60 minutes, or until the sponge is golden and just firm to the touch. Leave to sit in the tin for 5 minutes, then place a serving plate (with a lip to catch the caramel) over the tin and carefully flip over. Remove the tin and baking parchment and serve warm with ice cream or custard, if liked.